Marina Spooktacular is a Halloween party on the harbor, featuring L.A.’s only haunted pirate ships. Enjoy a scavenger hunt graveyard, a blackout maze of terror, trick-or-treating, DJ music, Día de los Muertos celebrations, food trucks, and more all day. 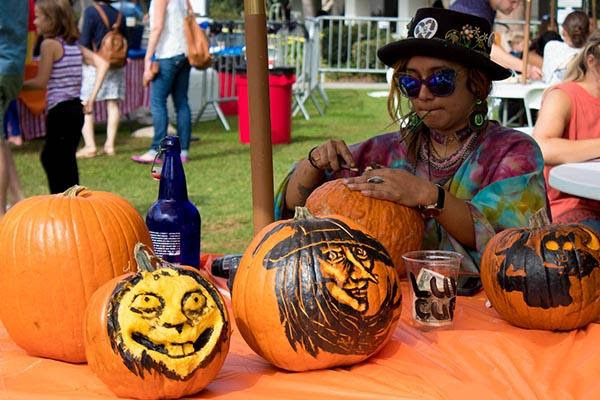 There’s fun and scares for all ages, but the frights intensify as night falls over Burton Chace Park in Marina del Rey during this two-day festival. Free admission. October 27–28. Calling all vampires, zombies, and monsters! Join this fun night of music, food, and cocktails on a three-hour harbor cruise aboard a luxury four-level yacht. Two dance floors offer DJ music entertainment. Embarkation at Dock 52. Cruises are offered on October 26 and 27. Questions? Call 844-227-7771. Head to this popular Irish pub on October 6 for an all-day Oktoberfest bash featuring contests, a horn ceremony, drink specials, and more. The fun kicks off at 10 a.m. Free entry before noon; $5 cover afterward. Dogs are welcome aboard Hornblower’s 1st Annual Dogs on Deck Yappy Hour Cocktail Cruise on October 20. The event is a fundraiser for L.A. Animal Services. Dog-training expert Darris Cooper will be in attendance along with a special guest appearance by Georgi la Corgi. Come in costume to compete in the Howl-o-ween costume contest.